I'm late getting to this singles series on Negative Fun from last year as they sent me a bunch of releases and I'm finally pushing them up front to cover this great stuff. I'm always impressed when a label like this can have their act together to plan out an entire series a year in advance. I can't even have it together enough to listen to them for crying out loud. This single is from Midnight Plus One, a three piece out of Carrboro, NC who are playing with expectations going from a dark minimal psych to towering power chords in the same track. A-Side's "Like Camera" starts with Casey's vocal by itself covered in distortion and thin guitars beamed through space on an AM radio wave from a far off the station. Casey repeats lines about ..'keeping you like a camera can do' when all at once this shifts clearly into focus with toms rolling under this meandering lead melody from the left channel. A stutter, jagged guitar works under this duo getting bigger as this creeps towards the chorus that shifts tempo. It's a slightly psych sounding dark track, Casey is hardly singing more like delivering the information without emotion, this is after all a narrator who wants to trap that partner under glass. This all blows up with walls of distortion and Casey layers in echo's getting more and more frantic in the attempt to keep things just as they are. B-Side's "White Flowers" has those layers of guitars playing off each other again, the subtle airy background chorus versus a jumpy zig zag line played with mittens. The heavy sound against that lighter ghostly touch continues into the rest of the track where it turns heavy and punk like the A-Side. A minimal understated start is quickly abandoned in favor of total chaos and power. They don't seem to be bound by the structure of a verse/chorus either, it's unpredictable when this thing will erupt and the drum solo says you won't know where either. You end in an entirely different place, from the Chan Marshall style observation to tearing down the walls sound of The Obits. 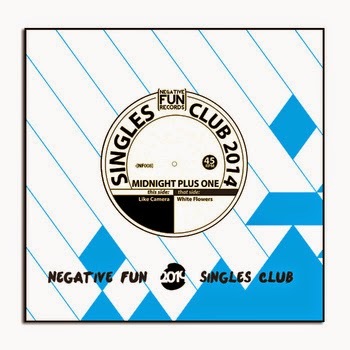 The series includes singles from Bad Daddies, Positive No, Midnight Plus One, No Other and Hot Dolphin. Pick it up direct (plus a test press!) from Negative Fun Records or just this one on their bandcamp.